Likud-Beiteinu (31), Yesh Atid (19), and HaBayit HaYehudi (11) = 61. This would allow either of the two smaller parties to single-handedly bring down the government. Likud-Beiteinu (31), Yesh Atid (19), HaBayit HaYehudi (11), and Shas (11) = 72. Ultra-Orthodox Sepharadi party Shas has told its supporters it will be in the next government. 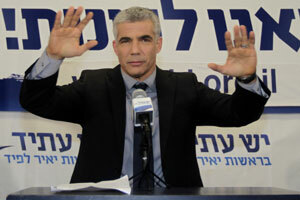 But will Yesh Atid be willing to be with an Ultra-Orthodox party? Likud-Beiteinu (31), Yesh Atid (19), HaBayit HaYehudi (11), and Kadima (2) = 63. Kadima was reduced from twenty-eight seats in the 18th Knesset to a mere two in the upcoming 19th. They would not be able to bring down the government, but they might join the coalition, if only to demonstrate they are still a viable party. Likud-Beiteinu (31), Yesh Atid (19), HaBayit HaYehudi (11), Shas (11), and Kadima (2) = 74. Shas would probably be willing to accept a new program of national service, since they are much more Zionist, and less extreme in general, than the Ashkenazi Ultra-Orthodox party, Yahadut HaTorah (United Torah Judaism). This would also keep Kadima on the political map. Likud-Beiteinu (31), Yesh Atid (19), and Shas (11) = 61. Likud-Beiteinu (31), Yesh Atid (19), Shas (11), and HaTenu'a (7) = 68. Tzipi Livni's HaTenu'a party might join, but they would demand that Netanyahu seriously enter into negotiations with the Palestinians. Then again, their power would be limited, as even if they would pull out, the coalition would survive. Likud-Beiteinu (31), HaBayit HaYehudi (11), Shas (11), HaTenu'a (7), Kadima (2) = 62. This would be very favorable for both HaTenu'a and Kadima, both of whom could single-handedly bring down the government. Which may be exactly why Netanyahu will avoid this. Likud-Beiteinu (31), Labor (15), Meretz (7), Hadash (4), Ra'am-Ta'al (3), Balad (2) = 65. The chances of this are less than the chances of............well, let's see here. Let's put it this way: The chances are greater that I will be appointed Chief Rabbi of Canada's Northwest Territories than this coalition happening. Labor has ruled out joining Netanyahu. Meretz is Israel's hard-Left party. And the other three parties are the Arab bloc. My best guess? Number 4. It gives Netanyahu two centrist parties, a nationalist party, and an Ultra-Orthodox party, and it prevents any one party, aside from Yesh Atid, from bringing down the government by itself.